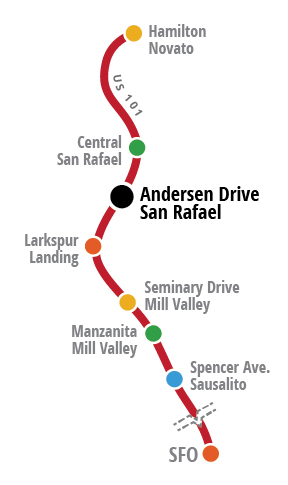 Buses depart Andersen Drive Terminal every 30 minutes, at :20 and :50 minutes after the hour. First bus departs at 3:50 AM and the last bus departs at 10:50 PM. The trip to SFO takes a minimum of 1 hour 10 minutes, but may take longer depending on traffic conditions. From Southbound 101: Take the Andersen Drive exit just after the 580 split, bear left, then turn left onto Andersen Drive. We’re about half a mile down Andersen, on the left. From Northbound 101: Take the Richmond Bridge/Francisco Blvd exit, turn right on Bellam, and left on Andersen. We’re about half a mile down Andersen, on the left. From Eastbound Sir Francis Drake Blvd: Turn left on Andersen Drive just past San Quentin. We’re about 3/4 mile down Andersen, on the right. Long term parking is available at a cost of $6.00 per day, or any portion thereof.